Charlotte Brontë was born on 21 April 1816 in the village of Thornton, West Riding, Yorkshire. Her father, Patrick Brontë, was the son of a respectable Irish farmer in County Down, Ireland. As the eldest son in a large family, Patrick normally would have found his life's work in managing the farm he was to inherit; instead, he first became a school teacher and a tutor and, having attracted the attention of a local patron, acquired training in the classics and was admitted to St. John's College at Cambridge in 1802. He graduated in 1806 and was ordained as a priest in the Church of England in 1807. In addition to writing the sermons he regularly delivered, Patrick Brontë was also a minor poet, publishing his first book of verse, Cottage Poems, in 1811. His rise from modest beginnings can be attributed largely to his considerable talent, hard work, and steady ambition—qualities his daughter Charlotte clearly inherited. Charlotte Brontë's earliest experience with school life could not have made teaching seem an attractive career. As Juliet Barker notes in The Brontës (1994), the record of her abilities in the school register hardly suggests that her potential was noticed: "Reads tolerably—Writes indifferently—Ciphers [arithmetic] a little and works [sews] neatly. Knows nothing of Grammar, Geography, History or Accomplishments [such as music, drawing, French]." Since the assessment of every other student is essentially the same, the register tells little about Charlotte but certainly reveals that Cowan Bridge was unlikely to recognize individual talent, much less foster it. The evaluation concludes with a telling comment: "Altogether clever for her age but knows nothing systematically." Charlotte found the rigors of boarding school life harsh in the extreme. Food was badly prepared under unsanitary conditions and, as a consequence, outbreaks of "low fever," or typhus, forced the withdrawal of many students, some of whom died. Maria developed consumption while at Cowan Bridge and was harshly treated during her incapacitating illness, an incident Charlotte drew upon in portraying Helen Burns's martyrdom at the hands of Miss Scatcherd in Jane Eyre. The seminal event of the Brontës' literary apprenticeship occurred on 5 June 1826, when Mr. Brontë returned from a trip to Leeds with a present for Branwell--a box of toy soldiers--to which all four children immediately laid claim. Each child selected a soldier as his or her own and, naming them for their respective childhood heroes (Charlotte's was the Duke of Wellington), they began to construct plays and narratives around and through the voices of these characters. The earliest of such works were written in an almost microscopic hand in minuscule manuscripts so they would be compatible in size with their supposed authors--the toy soldiers. Charlotte Brontë's juvenile tales revolve around the imagined adventures of the Duke of Wellington's two sons, Charles and Arthur Wellesley, and the social elite of "Glass Town," later transformed into the kingdom of "Angria." Arthur, soon elevated to the "Duke of Zamorna," is a recognizably Byronic hero who engages in romantic intrigues as well as in political treachery; his younger brother Charles is a less powerful, often humorous figure, who spies and reports on the scandalous doings of his Angrian compatriots--particularly his brother and his many paramours. Both Wellesleys are authors, and it is significant that Brontë's attractive but morally reprehensible Duke of Zamorna develops into the poet of the family while Charles emerges as a storyteller and her favorite narrator. While the juvenile writings of the Brontës have been justly compared to fantasies, they were not merely uninformed imaginings. 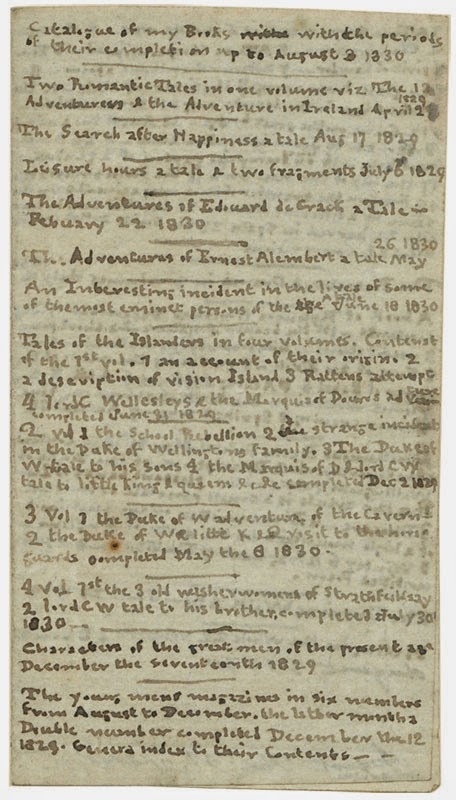 For example, early stories such as "A Romantic Tale," dated 15 April 1829, reflect the young writers' familiarity with articles on British colonizing in Africa published by Blackwood's Magazine in 1826 as well as more expected sources such as the Bible (especially the Book of Revelations), standard educational texts such as J. Goldsmith's Grammar of General Geography (1825), the works of Bunyan, the Arabian Nights Entertainments, and Tales of the Genii (1820) by Sir Charles Morell (pseudonym of James Ridley). It was during this early period of playful yet intense immersion in make-believe literary life that Charlotte Brontë first experimented with poetry. Producing sixty-five poems and a satirical play about poetry writing in 1829-1830, the fourteen-year-old self-consciously attempted to define herself as a poet. Though most of these early poems have a Glass Town context, being embedded within her narratives and spoken or sung by fictitious characters, some are only loosely connected to the stories. Many are interesting in that they reveal Brontë's exposure to current literary debates such as those concerning "neglected genius," the role of tradition and imitation versus originality and inspiration, and the public reception of poetry in a changing literary economy. The various poetic forms that Brontë experimented with during this time reflect her self-designed apprenticeship through imitation of earlier poets. For example, her many descriptions of natural landscapes are indebted to the eighteenth-century topographical poem that had been developed by "nature poets" such as James Thomson and William Wordsworth. Also, the influence of the popular Thomas Moore can be seen in Brontë's many poems written as songs. Literature cannot be the business of a woman's life: & it ought not to be. The more she is engaged in her proper duties, the less leisure she will have for it, even as an accomplishment & a recreation. To those duties you have not yet been called, & when you are you will be less eager for celebrity. Brontë's reply to Southey and the fact that she preserved his letter in a wrapper inscribed "Southey's Advice | To be kept forever" seem to suggest that she submitted to his masculine authority, but her prodigious literary output during this period, particularly of poetry, tells a different story. Between January 1837 and July 1838 Brontë wrote more than sixty poems and verse fragments, including drafts of what were eventually to be some of her best poetical works. However, they remained fragmentary and defective; it was not until 1845 that she was able to revise them into poems she was willing to publish. Unlike her sisters' contributions, nearly all of Charlotte Brontë's poems in the 1846 volume are reworkings of much earlier compositions, mostly from the prolific period of 1837-1838, which she revised expressly for publication in this volume. 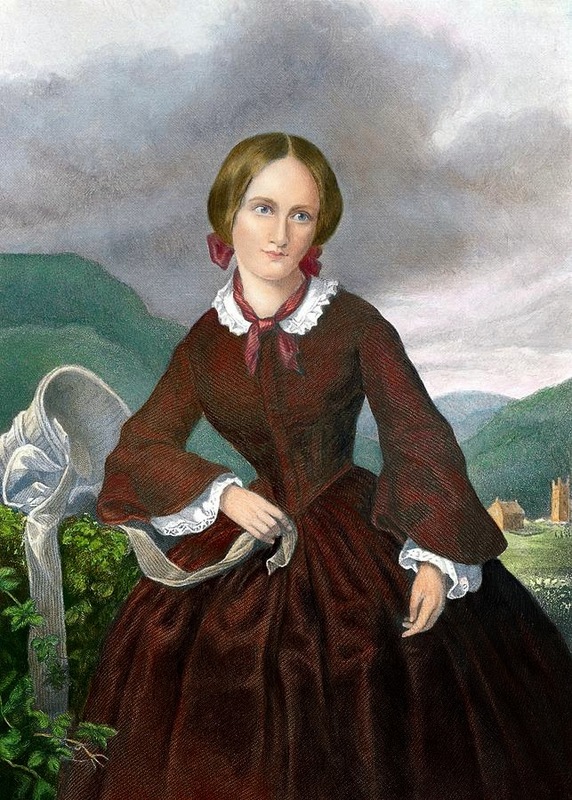 In preparing her poems Brontë not only deleted all references to their original narrative contexts, as her sisters did for their "Gondal poems"; she additionally changed them to suit her new readership, invoking popular motifs (such as the sailor's return in "The Wife's Will") and expressing sentiments that were culturally resonate in 1846. Though Brontë made every effort to publicize Poems, paying for advertising and requesting that Aylott & Jones send review copies to fourteen periodicals, the volume sold poorly--only two copies in the first year--and received only three reviews, which were, however, rather favorable. Originally priced at 4 shillings, the volume was republished by the publishers of Jane Eyre in 1848, and received more insightful critical attention after the publication of Gaskell's The Life of Charlotte Brontë in 1857. Though most critics have acknowledged the superiority of Emily Brontë's poems, a few reviews published in 1848 to 1849, when Jane Eyre was selling very well, favored Charlotte Brontë's; for example, the anonymous reviewer for the 10 November 1849 Britannia praised her "mastery in the art of word painting" and her "faculty of exhibiting in words the shadowy images of mental agony." Charlotte Brontë was not a successful poet in her own day, and today she is still rightfully known for her novels rather than for her poems. The inevitable comparisons between Emily's terse romantic lyrics and her sister's more discursive poetic style have produced a lower estimate of her poems than they probably deserve. "Pilate's Wife's Dream," for example, is arguably a much better poetic monologue than Elizabeth Barrett Browning's well-known "The Runaway Slave at Pilgrim's Point." Brontë is an important figure in the history of nineteenth-century poetry because her career illustrates the shift in literary tastes from poetry to prose fiction and because she employed, sometimes quite skillfully, the poetic modes that became characteristic of the Victorian period.